Pop, whoop, bam, whistle, clang, bloop-bloop went the New School of Music in Cambridge Saturday night, where Boston’s own Duo Zonda and New York City’s Hypercube started off the new season of the Equilibrium Concert Series, with composer Mischa Salkind-Pearl at the helm. 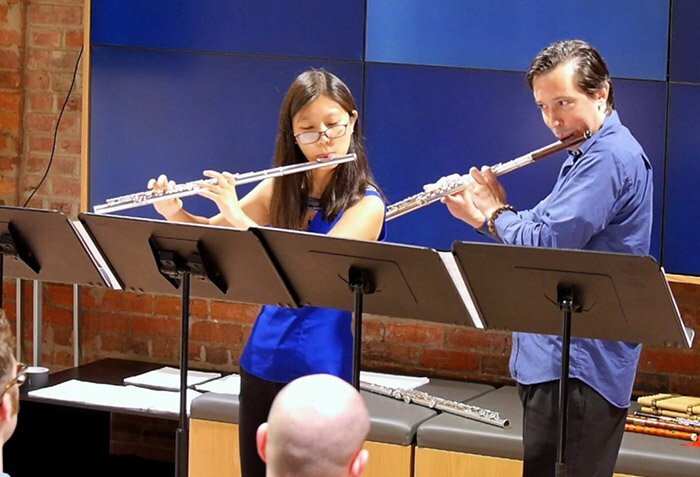 Boston-local, husband-and-wife flute duo Duo Zonda (Orlando Cela and Wei Zhao) won the pocket-sized audience over with dynamic energy and charm, despite that this was only their second program together. Eduardo Bértola’s Anjos Zifópagos (or “Siamese twins”) from 1976 was the only work we heard from a dead composer. Employing extended techniques such as flutter tongue and residual tones, both instruments followed one another closely in the ever-changing tones and timbres, mirroring two creepy, irate, twin cats. The duo’s interpretation was both superb and incredibly dynamic; their sharp contrasts taking everyone in the audience by surprise. Three Miniatures by Jessica Rudman mimicked a Russian neoclassical model in both spirit and structure. The quick and contrapuntal first movement overlapped timbre in its flute and piccolo instrumentation. The second movement, a slow, cantabile aria, evoked a Shostakovich slow. The third movement, both playful and sarcastic, ended abruptly, after barely a minute. Duo Zonda’s playful energy was key, as their intense collaboration revealed all of the rigorously-woven counterpoint. Composed by Ryan Zhang for the Charlotte New Music Festival, Intersections of Color, constitutes something of a study in diverse, extended technique, particularly in its interchanging between percussive and lyrical sections. Zhang melded the two flute parts tightly, and kept them perpetually moving, both in sound and in physical motion; as the demanding score sheets spanned five music stands. At the end, the duo walked away from one another, spreading the sound. The drama of the movement only added to the zippy motion of the impressive Intersections. The first of the Correspondences, by Apostolos Paraskevas, a professor at Berklee College of Music, possessed a mysterious but longing quality. The second sounded inquisitive and unrestful. The third was contrapuntal, constantly moving, and agitated, as if he was spewing off rapid-fire words. Though in brief remarks Paraskevas had claimed not to know what these pieces were about, these letters gave the impression of very private thoughts. Duo Zonda conveyed this intimacy pointedly, their lush tones creating a sublime mixture of textures. Zhao and Cela brought forth the sensitivity and subtlety of a mature ensemble. One of Equilibrium’s own (Aaron Jay Myers) composed, Illusion of Control, based upon our belief that we have control over our lives. The tightly-knit instrumental voices conveyed an effortless feeling of control, though Myers’s extended techniques such as flutter tongue, tongue pizzicato, and whisper tones revealed our illusion. Throughout, I enjoyed the duo’s sarcastic and whimsical approach. Chen Yi’s Three Bagatelles from China West mixed of East and West (as her music often does), overlapping a near American western style with Chinese influences. Was this attributable to her current residency in Kansas City? Duo Zonda’s interpretation showed openness, understanding, and richness. 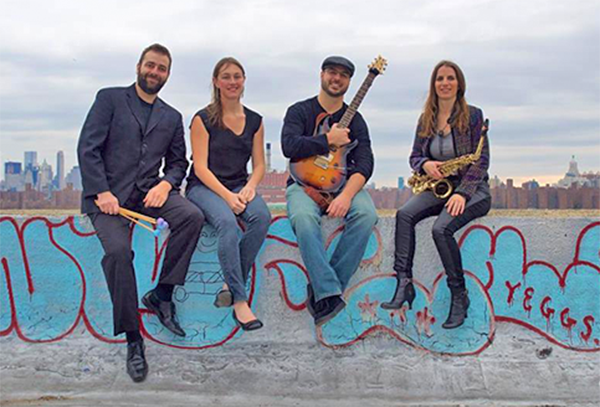 The New York City-based Hypercube, a frighteningly irregular quartet of saxophone, percussion, piano, and electric guitar (Erin Rogers, Jay Sorce, Andrea Loge, and Chris Graham), which took the stage for the second half, claimed to play underheard music. Altogether,though, Hypercube sounded like an ideal blend of contemporary classical and heavy metal. Oftentimes when classical types include electric guitar, the overall effect is quite gauche, but not with Hypercube. Their intensity and seriousness had the audience both bobbing and pondering. Variations on a Still Point (mvt 1) by Christopher Cerrone unleashed a fierce, unchanging, rigid force. In the short movement’s traditionally formed theme and variations, the very slight variations required a controlled, unwavering ensemble. Four moved as one; not one instrument surpassed another as a leader. In Sahaf by Chaya Czernowin, this listener heard an eclectic mix of night sounds, which fits Czernowin’s translation, “drift.” The clangs of the piano, rasps of the electric guitar, rattling of the percussion, and snorts of the saxophone created a shudderingly tense effect, but in contrast, Sahaf relied on conversation between each instrument. Not a single phrase could survive without every instrument adding at least an ephemeral tone, creating an elegant haze. Andrea Loge’s fervency in the piano part derives special note, though all the players packed a punch. Louis Andriessen’s Hout (or “Wood”), representing tree branches growing into one another, paid homage to Steve Reich, as every instrument played the same motive, displaced by a sixteenth note. Hypercube gave us a ferocious, intense, and converging take. Without acute listening, the group simply would not survive the experience. Saxophonist Erin Rogers explained that Localized Corrosion by Philippe Hurel had several meanings, intending for “metal” to be construed in several ways: pieces of metal corroding from outside environmental effects, metal in the instruments of the composition (particularly the metal inside strings of the piano, the metal of the saxophone, the metal snare drums, and the metal strings of an electric guitar), corrosion of the listener, heavy metal music, and an elemental pure source corroding its way into the human ear. The pure sound that it produced could corrode a listener’s ear (particularly if one failed to heed the warning to put in ear plugs). This memorable night ended not with a whimper, but with a snarl.